RUSH: Oh, by the way, you heard the latest? While all the news on the terrorist was being uncovered and reported yesterday, you know what CNN was doing? 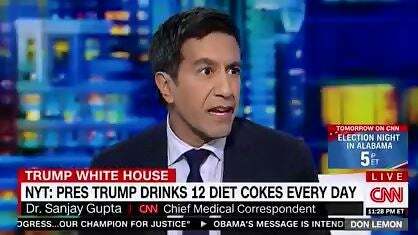 Reporting on how many Diet Cokes a day Trump drinks. And they even got their in-house doctor, Sanjay Gupta in there to explain how this can lead to dementia. I’m not kidding. You want to hear those bites? I’ve got ’em here. Let’s start with audio sound bite number 13. The indefatigable Brooke Baldwin worried about the Diet Coke consumption of Donald Trump. She’s talking here with gastroenterologist Dr. Samantha Nazareth. BALDWIN: It’s one thing to say 12 Diet Cokes, 12 Diet Cokes, right? If we’re saying, according to The Times, that he drinks this many, what does this do to the brain and the body every day. What does 12 do to you? NAZARETH: Not necessarily dehydrating but it’s replacing a liquid that you can take, which is water. You should be drinking water, not this. RUSH: Oh, gee. Now, here we go with the parentalism. (imitating Nazareth) “He should be drinking water, not these. Twelve Diet Cokes are replacing the other hydration he would normally be drinking and it’s just not good. It’s not good.” But they don’t tell us why, you just shouldn’t do it. I know a guy who drinks 15 a day of the giant gulp things. First thing he does waking up in the morning before combing his hair or anything. He gets in the SUV and heads to the nearest, you know, one of those massive gas station places and gets a giant 72-ounce big gulp of Diet Coke. And it’s gone by the time he gets home. Drives home, he’s sucking on the straw the whole time driving home. When he gets home he has to go back and get another one. BALDWIN: Is this doing anything super-crazy harmful or is it just mean and I’m not getting enough water? Is this doing anything to your bladder, your kidneys? RUSH: Where do they find these guests? NAZARETH: — if I have regular soda maybe have to stay away from all these sweets and everything else that may not be so healthy? You know, these people can’t have it both ways. They run around and tell us that sugar is gonna kill us, that caffeine’s gonna kill us, that oat bran’s gonna kill us (or alternately save us). Every day it’s some new health threat with a substance that’s natural and normal that everybody consumes, and then a couple of weeks or couple years later, “Ugh! We were wrong. This actually is not bad for you. Caffeine may actually help prevent Parkinson’s disease,” they tell you. GUPTA: That’s a lot of caffeine! We don’t know if he takes other sources of caffeine. It causes a lot of irritability, insomnia. Sometimes you become more unfocused when you’re drinking that much caffeine. LEMON: There’s a study released this last year researchers from Boston University School of Medicine found that people who drank one diet soda per take were three times as likely to be diagnosed with dementia or suffer from a stroke. GUPTA: You tripled, actually, the risk of dementia and stroke linked to diet soda. Is there something about a diet drink, the aspartame or something that’s causing this problem? They don’t know still. Could it be the people who are more risk for stroke and dementia also drink diet sodas? And then in the next sentence: “Is there something about a diet drink that’s causing the problem? We don’t know.” Well, if you don’t know… It’s kind of like if there hasn’t been any proof that the Russians hacked anything, then how can you say Trump colluded with them? So if you believe that Diet Coke leads to dementia or stroke but you don’t know why, then how can you make the claim? By the way, how widespread is the claim that Diet Coke consumption causes dementia or stroke? Trump is 71 years old, and he’s healthier than most of the people covering him. He’s got more energy than most of the people covering him. He’s got more mental acuity. He’s more intelligent, he knows more — he simply has absorbed more knowledge — than most of those covering him. And jacked up on caffeine? I don’t know. Look, the caffeine content of Diet Coke, I can’t attest to. Everything’s personal. I can’t attest caffeine doesn’t affect me at all. If it does, I’m not aware of it. Nothing I do because of the caffeine hit is based on it. There isn’t one, as far as I know. So this is the kind of stuff, folks — this is the kind of irresponsibility — that could lead to Diet Coke being taken off the market. I mean, these people are so crazy that if they want to use Diet Coke and 12 cans of it a day to prove that Trump has got dementia, is gonna have dementia, gonna get dementia, gonna have a stroke or has had a stroke, then that’s how they would lead to getting Diet Coke off the market. And it would all be to further establish the connection to Trump’s insanity and dementia and whatever else they claim he is to his Diet Coke consumption. Did CNN ever do any stories on how much damage to the brain smoking a few joints a day as a teenager or college student could do? We know that Obama was part of a chum gang, churn gang, choom whatever. He smoked marijuana with his buddies. There have been reports that he’s gone back to it since leaving the Oval Orifice. Did CNN ever do any stories on the consumption of joints and marijuana? Of course not because if Obama does it, it’s wonderful. If Obama does it, it’s great. If Obama does it, no harm can come from it.